It wouldn’t be summer in Arlington without at least one expedition to Six Flags Over Texas, where families can kick back or enjoy a few chills, thrills, and memorable moments on El Aserradero (Six Flags’ legendary “Log Ride”), the Chaparral Antique Cars (another Six Flags classic) or the AQUAMAN Splashdown—and that’s just a short list for starters. Check out more Six Flags family rides. When you’re ready to cool off, head over to Six Flags Hurricane Harbor, where you can take in an all-family float down the Lazy River or lounge in the shade while the kids splash and play at Hook’s Lagoon Treehouse. Or, if you’re in the mood for a little adventure, try the Sea Wolf, a three-to-a-toboggan slide with 830 feet of nonstop and delightfully unpredictable weaving turns and wavy slopes – get ready to get seriously soaked! K1 Speed: You and your kids can unleash your inner speed demons at this high-performance indoor kart experience that also features an arcade and motor sport memorabilia mini-museum. Breakout Games: Put your code cracking and clue connecting skills to the test in this real-life escape room experience that just might become a favorite family tradition. Living Science Center: The magic of the critter universe ignites at this wonderful nature center featuring aquariums, terrariums, nature trails and a pond—plus, you can explore the beautiful River Legacy Park afterwards. International Bowling Museum: Even if you’ve never picked up a bowling ball, you’ll still find opportunities to learn and have fun at this one-of-a-kind museum offering vintage bowling artifacts, rare film clips, and interactive exhibits—there’s even a bowling-themed gift shop and a miniature bowling alley. Alley Cats: Rock climbing, Putt-Putt golf, arcade games, and more—there are so many ways for families to have fun at Alley Cats, it’s hard to know where to start. For ideas, check out the Alley Cats website, where you’ll also find details about special summer promotions and late night hours. UTA Planetarium: One of Arlington’s coolest “secret” destinations is also a great choice for memorable family fun, offering star-gazing and pre-recorded shows projected on a 60-foot dome screen with state-of-the-art surround sound. Whether you’re hosting a get-together with other couples, girls’ night, or an afternoon with the bros from the office, it’s hard to beat a Texas Rangers game for classic summer fun. When planning your outing, be sure and investigate the Rangers’ promotional schedule as well as the team’s ticket special page to discover opportunities to save a few dollars, score dollar hot dogs, or take in a game with a Friday fireworks show. Want to do the Rangers in style? Check out Globe Life Park’s amenity-packed Hyundai Club or luxury private suite options, where you can upgrade your ballpark outing to include premium food and beverage packages, private restrooms, flat screen TVs, and our most favorite amenity of all—ice cold air conditioning. Besides the Rangers, there are also lots of great options for fun with friends at Lincoln Square or Arlington Highlands, where you can park and walk to dozens of shops, restaurants, bars, and entertainment destinations, like Dave & Buster’s, Studio Movie Grill, BoomerJacks, or The Melting Pot. Also, don’t forget about Downtown Arlington—particularly the Levitt Pavilion, where you can enjoy free live music under the stars performed by some of the best acts around (including a number of current and future Grammy winners). Pack a wine-and-cheese filled picnic basket and bring your lawn chairs or blankets—or, enjoy Irish Nachos, burgers and beer purchased on site from the legendary J. Gilligan’s or an icy snow cone from Bahama Buck’s. Find out more about the Levitt. If you love pro sporting events, you won’t want to miss a summer Dallas Wings game at College Park Center, where you’ll enjoy an afternoon or evening of WNBA basketball in an easy-to-access, world-class venue that’s just minutes away from other Downtown Arlington destinations—like Arlington Music Hall, Urban Union or the Arlington Museum of Art (don’t miss the “Cut! Costume and the Cinema” exhibit that runs through Aug. 12). Another don’t-miss Downtown Arlington destination is Free Play Arlington, where $10 bucks gets you all-you-can-play privileges in an arcade stuffed with retro video and pinball games. 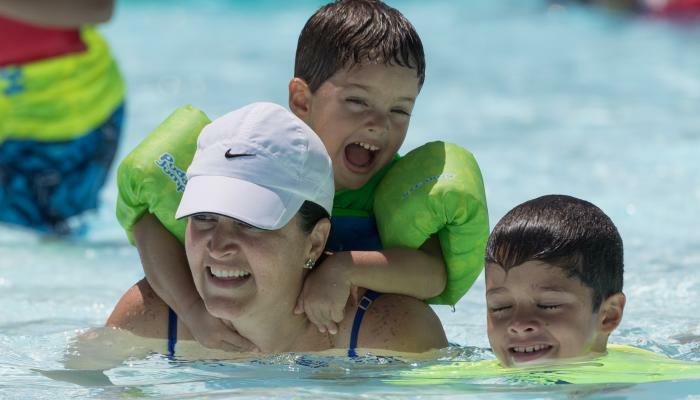 If you want to enjoy the sun and the water at the same time, Hurricane Harbor is definitely a top option —but don’t forget about the kayak paddling trails at Lake Arlington and River Legacy, or the fact that you can also go fishing at Lake Arlington, too. Love golf, or want to learn how to swing a club? You’re in luck, because Arlington is now home to the world’s first Major League Baseball-themed golf course: the brand new Texas Rangers Golf Club, a $24-million premium golf facility that includes a restaurant and bar, a covered patio that overlooks the course, pro shop, a deluxe driving range and practice facility, and a designer course offering 18 holes of challenging play for golfers of all ability levels. Find out more. Other golf options in Arlington include the beautiful, award-winning Tierra Verde Golf Club, which is also noteworthy as the world’s first municipal golf course to be certified as an Audubon Signature Sanctuary, as well the Arlington Golf Center, which offers golf instruction and a high-tech driving range experience, as well as an elaborate miniature golf course that’s fun for the entire family. Sports and sun lovers should also check out the Arlington Tennis Center, where you can enjoy daytime and evening play on any of the center’s 26 courts, as well as private and group instruction for players of all levels. And lastly, if you’re looking to try something a little different this summer, you might check out FootGolf course at Meadowbrook Park—it’s a cool combination of soccer and golf that just about anyone can play—or disc golf at Veterans Park, which is a blend of frisbee and golf that’s equally fun and easy to learn.